» Ads Coming to Beaches, Parks, Playgrounds and Other Public Spaces? Ads Coming to Beaches, Parks, Playgrounds and Other Public Spaces? Venice Beach is one of Southern California’s most popular tourist destinations, which is one reason why the city might be eager to approve a plan to sell thousands of square feet of commercial ads on everything from fences and light standards to benches and restroom doors. The plan, put forward by the L.A. Parks Foundation, a private non-profit that raises money for maintenance and improvements at city parks and recreation facilities, would place more than 200 signs in an eight-block stretch of Ocean Front Walk, commonly known as the Boardwalk. Most would be concentrated in the area of the Venice Beach skate park, Muscle Beach, and the paddle tennis and basketball courts between Windward Ave. and Venice Blvd. Note: KCET’s SoCal Connected series is airing a program on this issue tonight (Feb. 10) at 9 p.m. Click here to watch a promo. 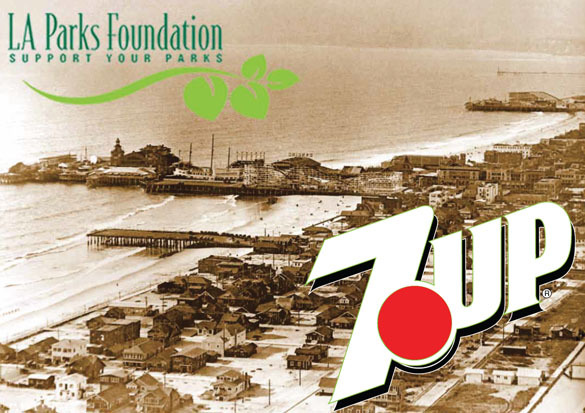 The marketing brochures for Venice Beach also calls the sponsorship opportunities “A unique way to educate audience (sic) about the history of Venice Beach.” This “education” isn’t further explained, but included is a historic aerial photo of the beach with a large, modern 7-Up logo superimposed upon it. Before such ads become reality, the proposal would have to be approved by the city’s Recreation and Parks Commission. However, commission president Barry Sanders is also chairman of the L.A. Parks Foundation’s board of directors, and the commission last year approved a plan to allow Warner Bros. to put images from its upcoming “Yogi Bear” movie on signs in three city parks. That proposal was aborted after opposition from local neighborhoods as well as the City Attorney’s office, which said that advertising signs in the parks would violate the city’s ban on off-site and supergraphic signs. At that time, Sanders, a retired corporate attorney, publicly disagreed with the City Attorney, arguing that even though the Yogi Bear images were identical to those used in the movie studio’s extensive marketing campaign, they weren’t advertising but only recognizing a Warner Bros. corporate donation worth $46,636 to the city. The city attorney’s office hasn’t publicly commented on L.A. Parks Foundation plan, which includes ads in 11 city parks, 27 child-care centers, 12 tennis courts, 10 municipal pools, 9 dog parks, and 8 skate parks. Ad space would also be sold at the Griffith Park Pony Ride and the Pershing Square ice skating rink downtown. For full list of parks and facilities, click here. The ad space on Venice Beach, totaling almost 10,000 square feet, or the equivalent of 15 full-size billboards, may be incompatible with regulations in California’s Coastal Zone, which generally prohibit off-site advertising. City Councilman Bill Rosendahl, who represents Venice, has not publicly commented on the parks foundation plan. However, he has advocated for corporate sponsorships to help pay for maintenance of the Venice skate park, which he was instrumental in getting built. To see an animated video on the Venice Beach ad plan, click here. That proposal was aborted after opposition from local neighborhoods as well as the City Attorney’s office, which said that advertising signs in the parks would violate the city’s ban on off-site and supergraphic signs. At that time, Sanders, a retired corporate attorney, publicly disagreed with the City Attorney, arguing that even though the Yogi Bear images were identical to those used in the movie studio’s extensive marketing campaign, they weren’t advertising but only recognition of a Warner Bros. corporate donation worth $46,636 to the city. resents Venice, has not publicly commented on the parks foundation plan. However, he has advocated for corporate sponsorships to help pay for maintenance of the Venice skate park, which he was instrumental in getting built.